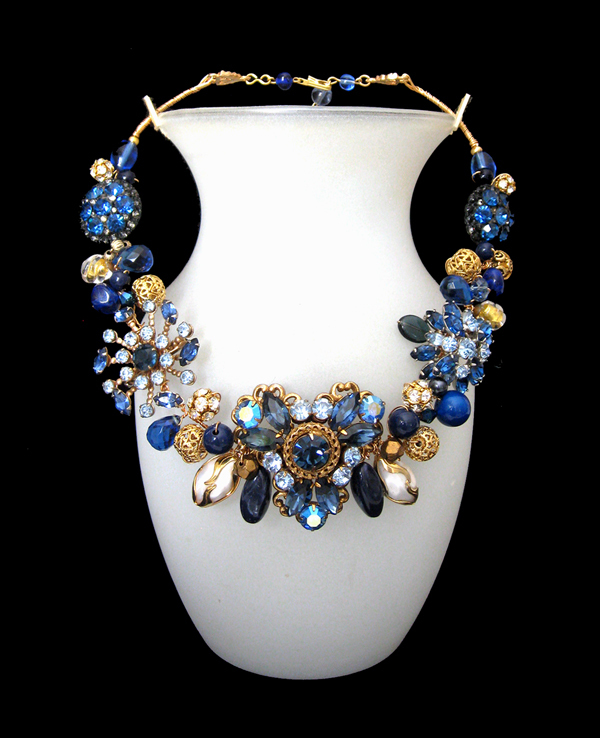 Vintage Gold- plated Swarovski Rhinestone clasp with vintage glass beaded extender. Fabulous rare vintage Gold-Plated "Regency" filigree brooch with Swarovski Dark Sapphire, Light Sapphire, and Sapphire/Aurora Borealis Rhinestones. Vintage "Deauville" pearlized Lucite ovals with original rare beadcaps (2). Vintage glass Navy Blue elongated ovals (2). Vintage "Monet" Gold-Plated filigree rounds (4). Swarovski Crystal Rhinestone Gold-Plated "Ball" beads (4). Amazing antique Czech Dark Sapphire Rhinestone buttons (2). Rare vintage Venetian Glass nuggets with 24kt Gold foil inclusions and original beadcaps (2). Blueberry Quartz faceted teardrops (3). Vintage gold plated dark and light Sapphire Swarovski Rhinestone flower brooch. Vintage dark and light Sapphire Swarovski Rhinestone cluster brooch. Vintage German glass gold/bronze faceted nuggets (2). Vintage German glass Montana Blue flattened ovals (2). Vintage Czech glass Royal Blue nuggets (2). Vintage Czech glass Navy Blue rounds (6). Vintage German glass blue ovals (2). Vintage Celtic engraved flattened metal round.